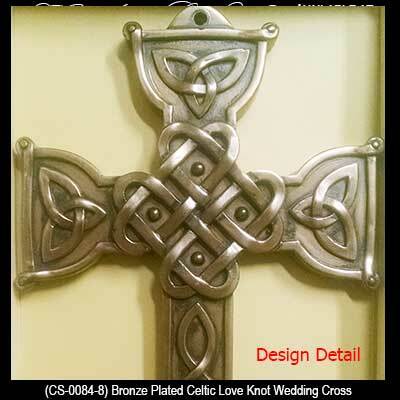 The Celtic love knot wedding cross features interlacing hearts in the center with Trinity knots on the arms; it measures 5 1/2" wide x 8 1/2" tall x 1/2" deep. 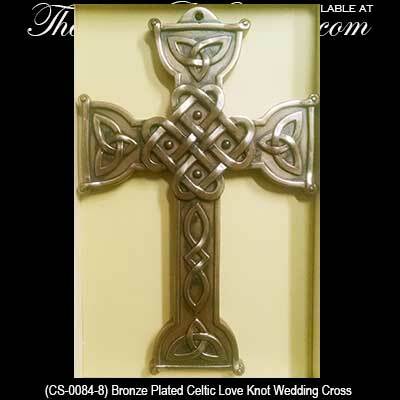 This Irish wedding cross has a cold cast bronze plated construction that is ready to hang on your wall. The dimensional design love knot cross is gift boxed with Celtic knot and Celtic cross history cards, complements of The Irish Gift House. This Celtic wall cross, with its central motif of interlacing hearts, represents eternal love. High Celtic crosses can reach heights of over 12 feet and the classic ring that connects the arms is a symbol of eternity. In ancient Ireland Celtic crosses were typically carved of sandstone or granite and indicate a holy place. Wooden Celtic cross is carved design that may either hang on your wall or stand.